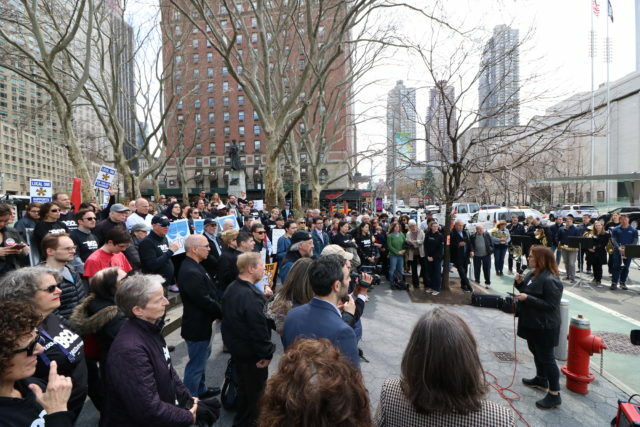 NEW YORK, NY – Friday, April 12, 2019 – Over 150 musicians stood together at Dante Park, directly across from Lincoln Center, to demonstrate solidarity with their colleagues on strike at the Chicago Symphony Orchestra. A group of thirty brass musicians from the Metropolitan Opera, the New York Philharmonic, and the New York City Ballet performed, conducted by Joseph Alessi, Principal Trombone of the New York Philharmonic. The Local 802 AFM musicians spanned every genre from Broadway to classical to indie, and the musicians were joined by their fellow union members from Actors’ Equity, American Guild of Musical Artists, IATSE Local One, IATSE Local 764, the New York City Central Labor Council, AFL-CIO, SAG-AFTRA NY, and the Stage Directors and Choreographers Society. Read more. 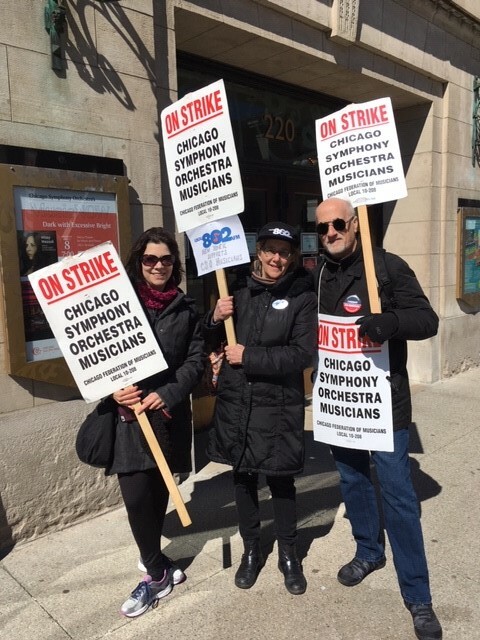 NEW YORK, NY – Thursday, April 11, 2019 – Local 802 musicians will stand together on Friday, April 12 to show their solidarity with striking Chicago Symphony Orchestra musicians. Musicians from the Metropolitan Opera, the New York Philharmonic, and the New York City Ballet will be joined at Lincoln Center by musicians who work in every genre and venue across the New York music scene to demonstrate unity for fair wages and benefits for all working musicians. Emma Gerstein, flutist at the Chicago Symphony Orchestra, will also speak about the ongoing strike. Read more. NEW YORK, NY – Thursday, March 21, 2019 – As many of you know, the Trump Administration has proposed terminating funding for the National Endowment for the Arts (NEA) as part of its proposed budget. Defunding the NEA would have a strongly negative impact not only on many young and emerging musicians who depend on NEA grants, but also on music education and the underserved communities that benefit from NEA support. That’s why Local 802 strongly opposes any cuts to the NEA’s budget. Read more. 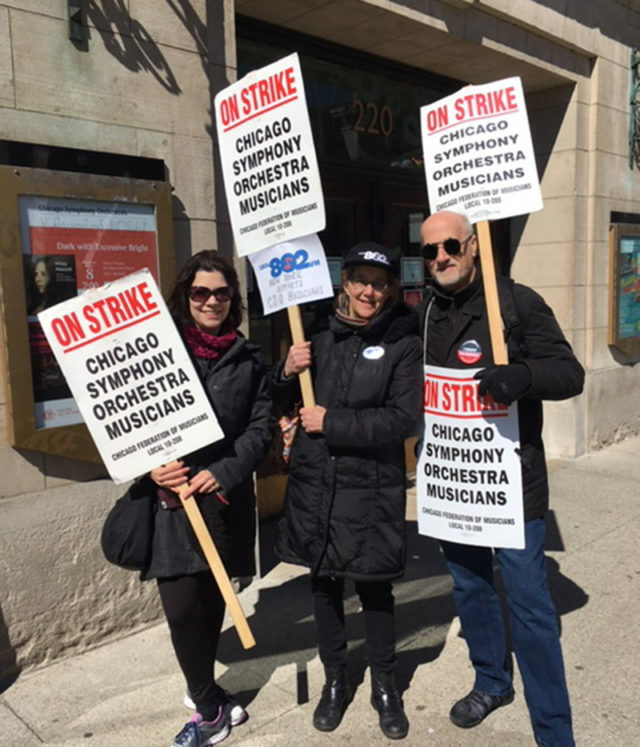 Local 802 Executive Board member Lynne Cohen supporting CSO musicians on the picket line in Chicago. NEW YORK, NY – March 13, 2019 –The promise of a pension is a sacred one and the musicians of the Chicago Symphony Orchestra are right to insist that it not be compromised. The Chicago Symphony Orchestra has assets of over half a billion dollars and is more than capable of managing its pension liabilities without shifting all the risk onto musicians. The musicians of Local 802 support the strike by the members of the Chicago Symphony Orchestra and urge CSO management to do the right thing and honor their pension promises to the musicians. Read more. 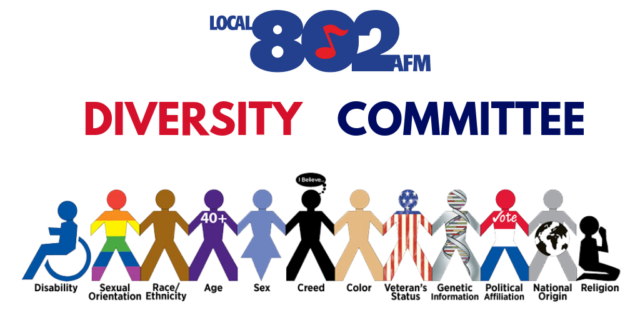 NEW YORK, NY – February 14, 2019 –The Associated Musicians of Greater New York, Local 802, AFM expands its membership outreach initiatives with the formation of a diversity and inclusion committee. Chaired by Broadway musical director Steven Cuevas and co-chaired by renown jazz drummer Alvester Garnett, the group amalgamates union musicians from all backgrounds. The committee’s mission is to work collaboratively, to advocate and support diversity, and to promote equal opportunities for union musicians. Read more. 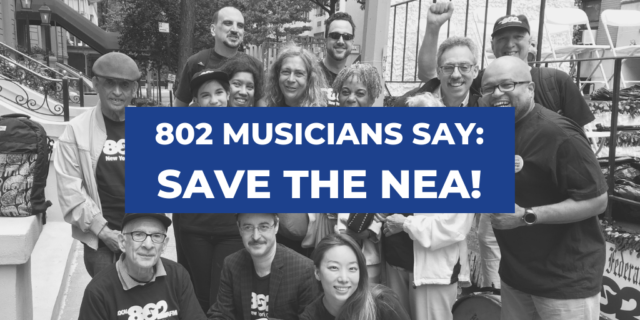 NEW YORK, NY – January 9, 2019 – The Local 802 Musicians’ Union supports Actors’ Equity in its effort to secure just compensation for its members. Broadway is booming. Grosses and attendance are at all-time highs. This is made possible by the creative and performing artists who do the hard work of developing and performing in these productions. Read more. 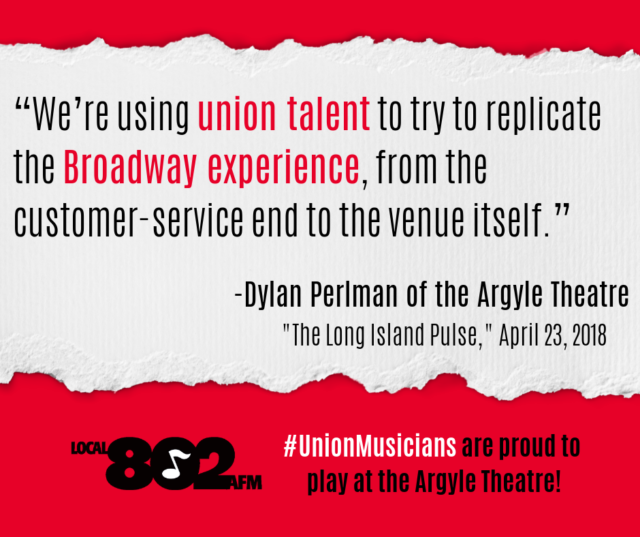 BABYLON, NEW YORK – January 2, 2019 – The professional musicians who perform in musical productions at Babylon Village’s Argyle Theatre have started the unionization process with the Associated Musicians of Greater New York, Local 802 AFM. A majority of the orchestra musicians have expressed their intent to unionize and are now seeking official certification of their union through a National Labor Relations Board election process. Read more. 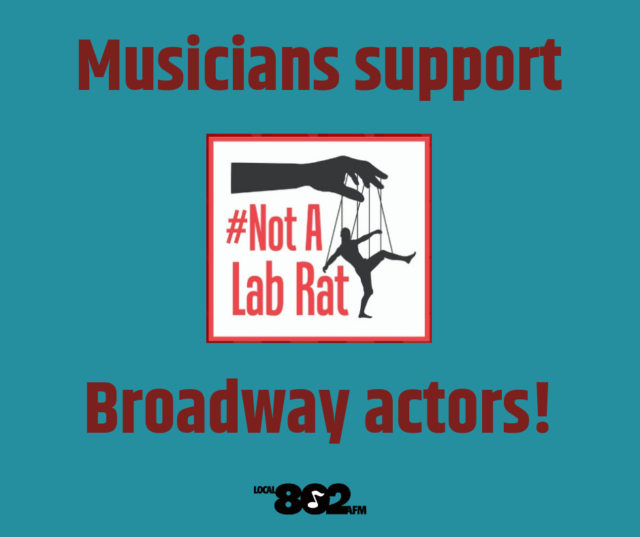 NEW YORK, NEW YORK — November 16, 2018 — The Associated Musicians of Greater New York, Local 802, AFM is calling on popular Broadway performer and pop music star Josh Groban to demand that his management at Live Nation sign a union contract for the protection of orchestral backing musicians contracted to play his Sunday, November 18th show at Madison Square Garden. Read more.